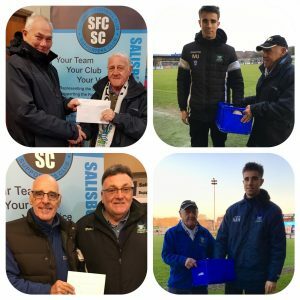 There is a great opportunity to go home rich at home games, when Supporters’ Club Committee members will be selling the famous SFCSC 50/50 tickets. They are £1 each and the winner gets half the takings, with SFCSC taking the other half. Throughout last season, as the gate numbers grow, so does the 50/50 draw with several lucky people taking home over £300 most weeks, so the more you buy the more you can win. All the proceeds go towards helping the fans or SFC special causes. 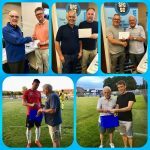 MIKE BAILEY won £352 at the recent Salisbury FC v Hartley Wintney game when his winning ticket number 91299 was drawn out by SalisburyFC goalkeeper Jake Hallett. Today’s FA Trophy game SalisburyFC v East Thurrock United 50/50 Draw winner was WILLIAM HALE. His lucky ticket number 91648 was drawn out by Jake Hallett at half time. William went home today with £333 and saw SalisburyFC thought to the next round of the FA Trophy.